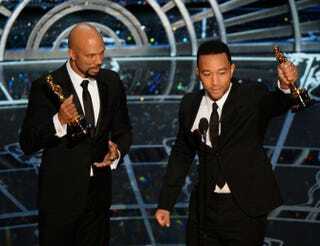 Musicians Common and John Legend address the audience after accepting the Oscar for best original song for “Glory,” from the film Selma, at the 87th Oscars Feb. 22, 2015, in Hollywood, California. Updated Sunday, Feb. 22, 2015, 11:30 p.m.: The Academy Award for best song was awarded to "Glory" from the motion picture Selma. The song was co-written by John Legend and Common, who performed a stirring rendition of the anthem at the Oscars Sunday night, bringing a standing ovation and leaving some in the crowd in tears. It was the sole Oscar awarded to the historical film, which commemorated the march by the Rev. Martin Luther King Jr. and civil rights activists from Selma to Montgomery 50 years ago. Updated Sunday, Feb. 22, 2015, 10:45 p.m.: The planned protest by Los Angeles civil rights groups outside Sunday's Oscar show was canceled at the request of film director Ava DuVernay, according to the Los Angeles Times. DuVernay directed the best-picture-nominated film Selma. "The Los Angeles chapter of the National Action Network has agreed to forgo our planned protests of the Oscars today and pursue instead a direct dialogue with the Academy of Motion Picture Arts and Sciences," the local chapter's political director, Najee Ali, said in a statement. A group of African-American civil rights leaders plan to hold a protest in Hollywood outside Sunday's Oscars show, where all of this year's 20 acting nominees are white, AFP reports. Earl Ofari Hutchinson, head of the Los Angeles Urban Policy Roundtable group, says the purpose of the demonstration is to draw attention to Hollywood's diversity problem. The Academy of Motion Picture Arts and Sciences, which awards Oscars, consists of voting members who are overwhelmingly white and have an average age of 60, the report says. "The goal of the protest is to send a message to the academy, send a message to Hollywood, send a message to the film industry," Hutchinson says, according to AFP. "And the message is very simple: You don't reflect America; your industry doesn't reflect America. Women, Hispanics, African Americans, people of color [are] invisible in Hollywood." Some of this year's snubs include the United Kingdom's David Oyelowo, who was widely praised for his role as Martin Luther King Jr. in Selma. The film's director, Ava DuVernay, was also left out, although the movie is among eight best picture nominees, the report notes. After an uproar earlier this year over the lack of black Oscar nominees this year, the academy's first African-American president, Cheryl Boone Isaacs, said that she was inspired to accelerate reforms to make the awards more inclusive. "Personally, I would love to see and look forward to [seeing] a greater cultural diversity among all our nominees in all of our categories," she said at the time, the report notes. However, Darnell Hunt, head of the UCLA's Center for African American Studies, and author of "The Hollywood Diversity Report," said that the academy is heading in the wrong direction. He plans to release an update of his diversity report in a couple of weeks, according to AFP, noting that 93 percent of the academy's members are white and about 70 percent male, while the average age is 63. "In many ways the academy is falling further and further behind because America is more diverse," Hunt said, according to the news outlet. In 2002 Halle Berry and Denzel Washington were celebrated for their breakthrough wins for best actress and actor, but rights groups say there has been little progress in the decade since then, the report notes.